This Bluetooth-enabled patch is worn on a patient's abdomen. It picks up signals from special tech-enabled pills when patients take their medicine. Chicago's Rush University Medical Center has begun to offer a tech-enabled pill that pings patients via their iPads if they forget to take a daily medicine. The health system says it's the first provider in Illinois to offer the technology, and one of only eight in the country using the innovation. Here's how it works: A sensor the size of a grain of sand—made of trace amounts of minerals that naturally occur in the body—is added to each capsule of a prescription. When a patient swallows a pill, the sensor is activated by stomach acid and sends out a signal picked up by a thin, Bluetooth-enabled patch the patient wears on his or her abdomen. If the patch fails to receive the signal, the system sends out a text warning of a missed dose. 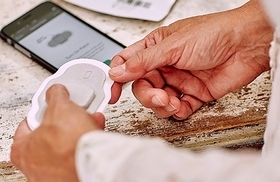 In addition to delivering medication reminders, the sensor can also track average heart rate, sleep and other health markers, and send reports and alerts via an iPad or smartphone app. Rush researchers say the technology helps ameliorate the health problems posed by widespread failure to take medicines as prescribed. "There's a fairly significant gap between the prescriptions providers write and the prescriptions patients take," says Dr. Anthony Perry, vice president for population health and ambulatory services at Rush. "When it comes to high blood pressure, the vast majority of patients respond nicely to medication. The trick is to ensure they're taking it." Photo by Proteus Digital Health This Bluetooth-enabled patch is worn on a patient's abdomen. It picks up signals from special tech-enabled pills when patients take their medicine. Rush University Medical Center has begun to offer a tech-enabled pill that pings patients via their iPads if they forget to take a daily medicine. The health system says it's the first provider in Illinois to offer the technology, and one of only eight in the country using the innovation. He says somewhere between 30 percent and half of patients who take pills for chronic conditions like hypertension fail to meet compliance thresholds, defined as taking medicine as prescribed at least 80 percent of the time. The pill, called Proteus Discover, is manufactured by Redwood City, Calif.-based Proteus Digital Health. The company has raised more than $300 million for its FDA-approved ingestible sensors. Rush is beginning to use the Proteus pills for patients with chronic conditions such as high blood pressure and Type 2 diabetes. Proteus is attempting to gain additional FDA approval to add its sensors to more drugs, including Abilify, an anti-psychotic used to treat depression and bipolar disorder. Though Proteus has an app for smartphones, Rush is using it only with hospital-provided iPads at the beginning, to ensure the system works correctly and patient information is protected. The iPads share patient data with a web portal so that doctors or nurse managers can access a patient's medication adherence history. The Proteus pills come only via mail order from a special compounding pharmacy that works with Proteus to add the sensors to each pill. The cost to the patient is identical to that of the traditional version of a prescription. Proteus is working with Rush to offset the additional cost of the pills and the technology. Perry says Rush will generally prescribe the pills to an individual for three months, a nod to Proteus' costs and to the science that underpins habit formation. "From a behavioral perspective, experts would say you need to perform a behavior consistently for about three months to create a pattern," Perry said. "We believe after that period, we can take the tool away and the pattern will remain." The pill harnesses the power of the so-called "quantified self" movement, in which people use technology to track health-related data points ranging from steps taken to blood sugar levels and time spent in deep sleep. "We already know that tracking improves engagement and that patients are engaged with My Fitness Pal (an app that tracks calories and activities)," said Amanda Tosto, Rush's director of systems integration and population health. The Proteus pill and web portal "is a way to see everything tracked in one place so we clearly communicate with patients based on the results." While the Proteus pill has high-tech appeal, Perry says Rush's interest in the technology is solely related to its ability to improve patient outcomes. "Leveraging technology to engage patients and get better outcomes aligns with our mission," Perry said. "That's why we do this kind of work." "This​ new​ smart​ pill​ reminds​ you​ to​ take​ your​ medicine"​ originally​ appeared​ in​ Crain's​ Chicago​ Business.